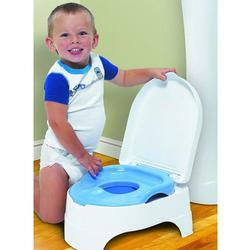 The All-in-One Potty Seat and Step Stool from Summer Infant covers three stages. Stage 1: A complete potty trainer on the floor. Stage 2: Toilet topper for standard sized toilet use. Stage 3: Step stool for accessing standard sized toilet and for promoting hand washing at the sink.